An inaugural race and unfortunately it shows. There were numerous issues with the race including packet pickup issues for both the prior day and day of, communication problems, the half course was short, the water stations did not have enough volunteers, there were no course marshals anywhere, there was no AG awards - not even age groups posted in results and the cost was the highest I've seen for a half marathon in Michigan. On a positive note, the swag was nice and it was a nice course(except it was short) but the race certainly has issues to work through before it would be one that I would come back or recommend. The race has some real potential, since it's a great theme, but details of any race are just as important. Since I received an entry into the race in exchange for this race review, my contact signed me up for registration. I will say that you registered online like most races today, however, the cost for the race plus convenience fee was higher than typical. If you registered late, the cost was $115 plus online fee for the half. 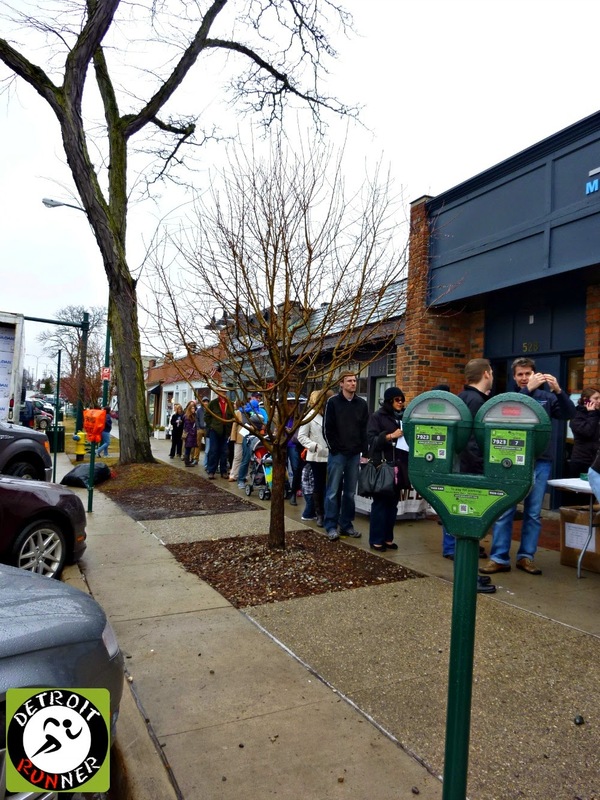 Early registration was still quite high at $85. I asked to be able to pickup my packet at the packet pickup location in Birmingham. Personally, I thought that it was nice to pickup closer to work rather than going down to Detroit twice. The race offered pickup on Friday and Saturday as well as race day packet pickup. Well, sort of. First they mentioned that there would be race day packet pickup, then they said there wasn't, then they told people to call if they could not make packet pickup, then they offered it race day again but it would be small. 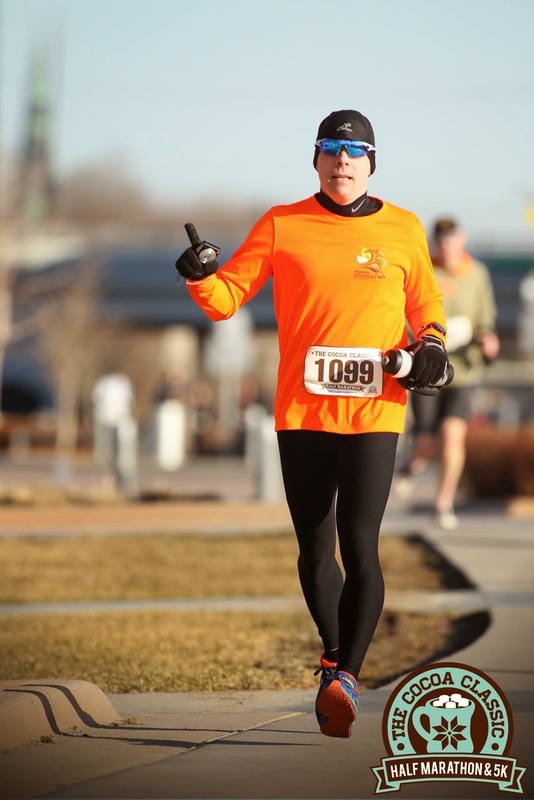 You did have the option to pick up a packet for someone as long as you brought the following: The registration showing the runner registered, copy of photo ID, a permission slip from the runner and a signed waiver. 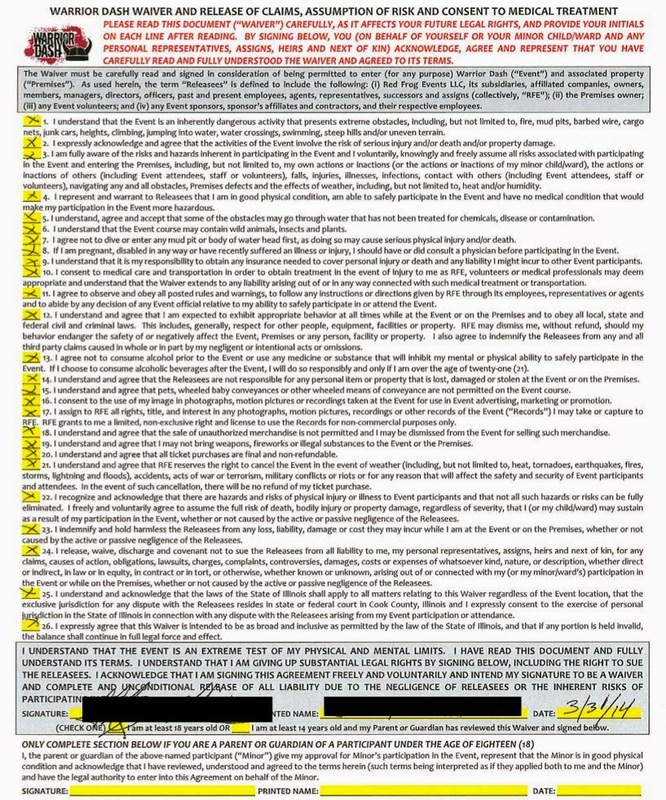 Speaking of the waiver, it was huge and there was 26 initials and your signature needed on it. While I realize this is the same company as the Warrior Dash which has significant more risks in getting hurt, it was really overkill on the release for a road half marathon and 5k. When I got to Birmingham on Friday, there was already a pretty long line. Most of the runners were there for the 5k pickup and since I was running the half, a girl called me up and I got my packet in literally minutes. It was a very easy process. 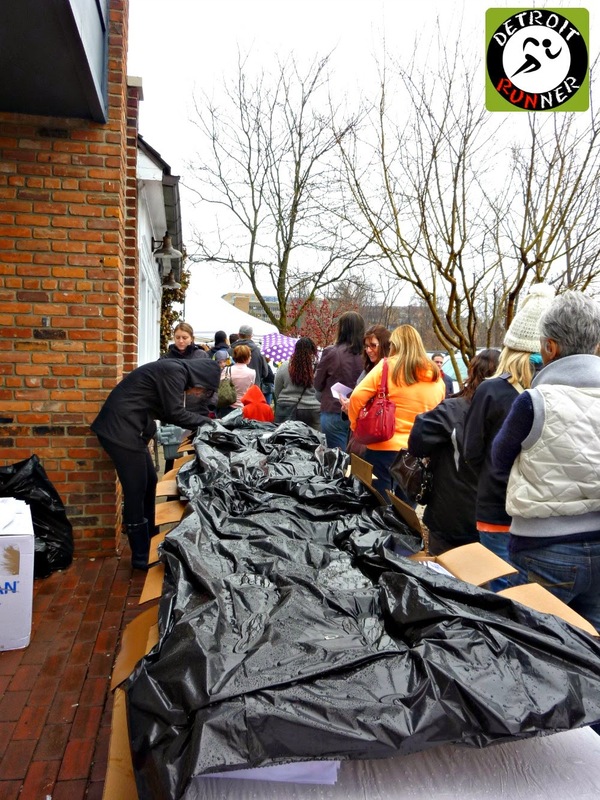 Of course, if you were running the 5k, you needed to wait in the line(see below), in the rain......outside! The girl I talked to said they expected 1,100 runners in the half and 5 times that in the 5k. With an expected 6,000+ runners, the race should have planned for a much larger packet pickup area that was also inside. In addition, parking in Birmingham can be difficult especially where the pickup location was in downtown. I got lucky and got a street spot about two blocks away. Unfortunately, it was a very poor location choice. Sunday morning was a very early morning as the half marathon started at 7am. I got down to Detroit pretty early(5:40am) and was one of the first people there. While I had to wait a long time in my car, I got a parking spot less than a block from the finish line so I was really happy with that. There were also numerous lots and structures to park at so parking choices were excellent overall. By the time I went out to see how things were set up(6:30am), the entire area was all ready to go for the runners. Since I did not have to pickup a packet, I was able to relax and just wait for the race so I got pictures of the whole area. Runners that were picking up were in a bit of a panic as the race was not very organized when it came to people picking up that day and some runners packets could not be found. I'm sure that was probably why the race didn't want race day pickup. My opinion is that all races should offer both especially since some people have to travel or work when packet pickup is and the race needs to be prepared for that. As you can see below, registration was not super busy at this time. I took a picture later on of the 5k which was a different story. The picture I took below was after 6:30am and the race specifically asked runners to be down there at least an hour before the race start. I was supposed to check in at the media tent and I did go there but there was nobody working in the area so I didn't know what to do. I was happy to have my packet so I didn't need to worry about it and just went to the start line to race. The race was getting set up for the the chocolate dipping treats. St. Jude was also onsite but I didn't talk with them about the event. The race and St. Jude have been good partners giving back some of the proceeds to this charity which is nice. The race posted that it raised $15,500 for St. Jude at the event. It's nice to see if the price is going to be higher than other races, they raised some good money for charity. The race had a DJ set up to not only play music but get the crowd excited and get the race started as well. He did a nice job. Sorry about the pictures but it was still dark when I took these prior to the race. The race seemed to have plenty of port-o-potties. I didn't see the line for the 5k since I just made it back from the half as the 5k was getting ready to go. There was more than enough for the half marathoners and they also had plenty of port-o-potties out on the course at every aid station - actually more than I've seen at any race. 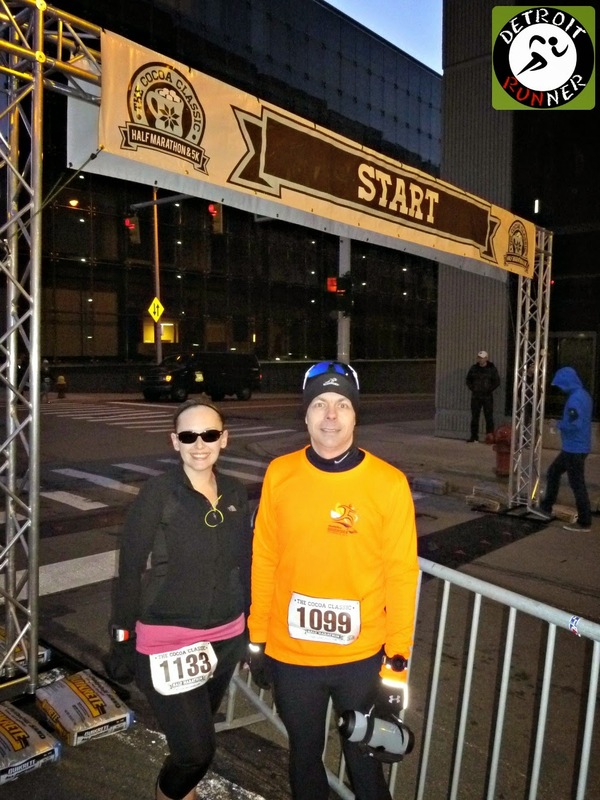 Prior to the race, I met up with Jamie from the SEMR's, a local running group, for a quick picture. With that complete, we were ready to get in line for the start. The start was easy since there were about 1,100 runners so we didn't need to get in line until five minutes before the start. Below is the course per my Garmin. The course was the best thing about the entire race. I really enjoyed the route overall and it was a perfect day to race with temperatures in the low 30's to start and finish in the 40's. I had no time in mind other than to be under 2 hours. I went out thinking I would be just under 2 hours but picked it up a little for a little larger cushion. With the exception of a couple things on course which I'll explain, overall, it was a nice route. While I don't put a huge reliance on my Garmin, the course measured out 12.89, which is the largest shortfall of any half marathon I've ever run(this was #22). The race was not certified but I was not expecting to fall short almost a 1/4 mile. I also confirmed this with numerous other runners that it was an issue and not just my GPS. Some work on measurement surely needs to be done to fix this issue for future years. It seems it would make sense to go through the process of certifying the course given the popularity in the first year. One thing that was really strange for a race with 1,100 runners on the half was the corrals. Not that corrals are strange as I like the idea of having them to space out runners paces appropriately. What is strange is that they let each corral go with about 3-5 minutes between the start. While I can understand doing this for a race that has 25,000 people or for an obstacle race, it was certainly not needed. Given this, it delayed our start since I was not in the first corral. In addition, the race ran about 5 minute behind from when the first corral started as well. Not a big deal - it's just a pet peeve of mine. I also found it strange that the race did not do the National Anthem. I've been at a few races that did not do it but it just feels right to have it, even if it's just a recording. With our corral up next, we were off and running. 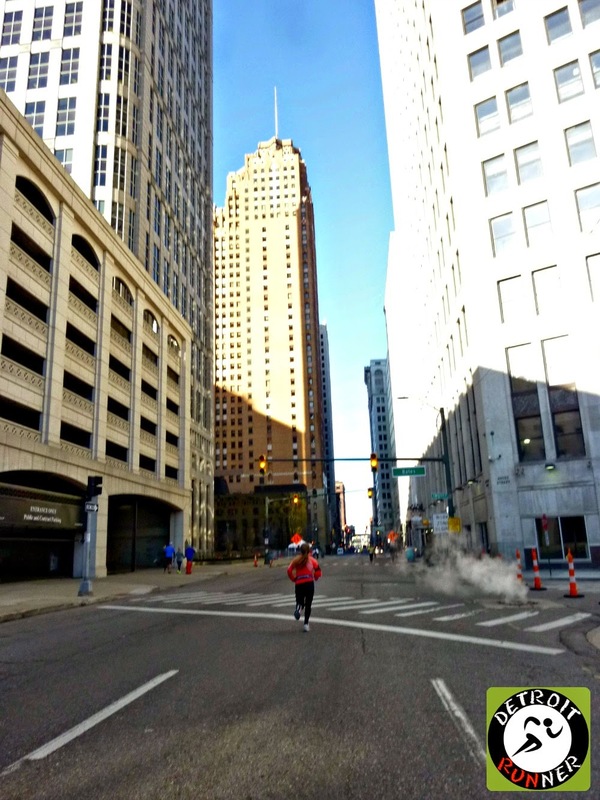 The first part of the course was right in downtown Detroit. It's one of my favorite places to race and this was no exception. The race had the course partially closed off from cars and the Detroit police were in full force throughout the course and did a great job. Another strange thing was the race had no course marshals out directing runners. For the most part, they were not needed but there was several spots that they were needed since you didn't know exactly where to go. They should have drove the course that morning to see where marshals might have been needed and got some volunteers to help. There was one spot near the end where it was a little hard to tell which way to go and I can imagine the front runners could have easily gone the wrong way. I was surely not expecting to run down a set of stairs! I just could not believe that anyone that runs would ever set up a course with stairs in the middle of it. I have never in all my races had stairs in the middle of a road race. In fact, I didn't think anyone would believe me so I stopped and turned around to get a picture of what people had to run down. Crazy! Stairs on the course - yes, you read that correctly. I will say the prize of the day was getting to the waterfront as the sun was just coming up for the day. It was a perfect day and a wonderful run on the river. We continued down the riverfront along the Riverwalk as we made our way back to Atwater Street. At this point, I had continued to follow the 8:24 pacer who was going much faster than that pace for at least the first several miles. I don't put blame on the race for this as I've ran with these pacers before in other races and they have always seemed to go out too fast. I ended up passing them on Jefferson so I'm not sure how the end turned out at that pace group. It was then off to Jefferson where we headed towards Belle Isle. I also really enjoy running on Belle Isle so you can see why I liked the course so much. It has some of the makings of the US half of the Detroit Marathon with some slight changes and also the course is run in reverse. As we moved into Belle Isle, there were a few spectators there cheering on runners. There were also a few other spots with spectators along the course but it was very minimal. If you want to have lots of spectators for your race, this is not one you will like. Since it really does not matter to me and I am more worried about a good course, it works for me. Running on the bridge into Belle Isle is a real treat and the only race I know that does this, other than this race, is the Detroit marathon. It's really fun. The race had some great views along the riverfront on Belle Isle like the one I took here of downtown Detroit. It's difficult to see but the Ambassador bridge is also there as well. With Belle Isle recently becoming a State park, I can't wait to see what it will look like this summer. There could have been a course marshal right after you got onto Belle Isle to help direct things. While I mentioned there were a few places on the course where you didn't know which way to go, for the most part, they were well marked like the photo shown below. The timing company had the half way split on there as well which is a nice feature in the race. The picture below is coming back onto the bridge leaving Belle Isle. It's one of my favorite pictures I've ever taken in a race. As you can see, the course is not crowded at all. A few more spectators as we head onto Lafayette and make our way back downtown. One of the owners of RUNdetroit, Alia, was cheering on runners as we passed and she said hello to me. It's nice to see people cheering for you that you know. We also passed an awesome church on this corner as well. Detroit really has some awesome areas to run through. The next couple miles are actually not my favorite as this is also part of the Detroit Marathon course. It's just an industrial and residential area that is a bit run down and could use some sprucing up. We then took a turn onto the Dequindre cut. I just recently ran on The Dequindre Cut in January for another race and it's a jewel for the city's runners. The organizers did a nice job highlighting some of the best parts of Detroit. Coming out of The Dequindre Cut, we go back onto Atwater and head towards downtown. This is also on the Mustache Dache course which is another one of my favorite routes. We have now made it back to downtown Detroit as we can see all the tall buildings now in the area which is almost at the end of the course. Above, we turned onto Griswold which I was surprised since it's a pretty busy road typically. Of course at about 8:45am on a Sunday morning, it's not that busy. We had one last turn into the finish. The race had barricades set up for the finish line area which was not much of a necessity for the half marathon but was certainly needed for the 5k runners. There were some more spectators at the finish line as well. There were plenty of aid stations on the course. Actually, I didn't use any of them because I always carry a water bottle of my own for the half distance or longer but they were out there with port-o-potties as well. There were not enough volunteers for each station though. Two-three volunteers are not enough. 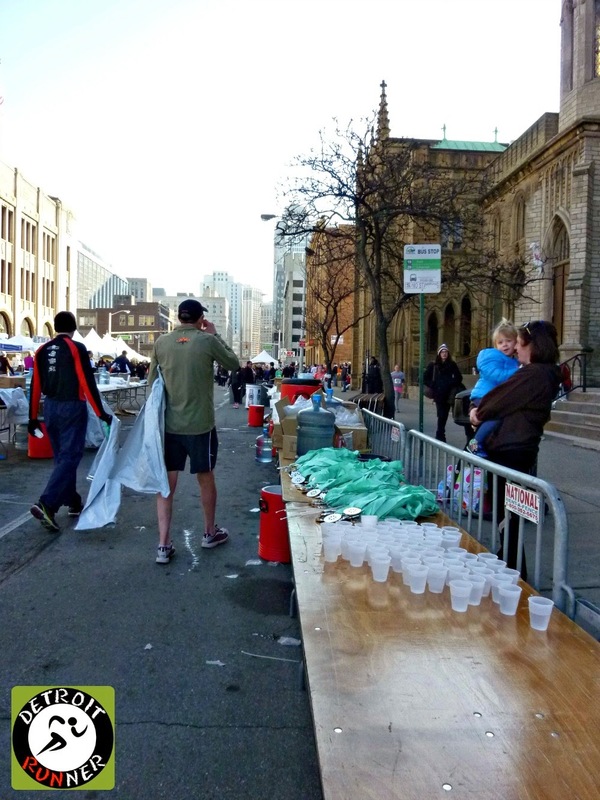 Also, at some of the stations, the volunteers set up all the water in plastic cups and set them out for runners to grab themselves. Typically you would have volunteers out there holding cups for runners and they did have that in some of the aid stations. On the aid station below, you can see that we are running on the left side of the road yet the aid station is on the right side(by the tent). Nobody was going to it because it was on the wrong side so it was two volunteers just standing there. It seems this could have been resolved prior to the race. There was one aid station on The Dequindre Cut that was located in a poor location on the bottom of a hill and around a turnaround. Having an aid station on the Dequindre cut is fine but I would have liked to see it in a location when you are not going down a hill and turning a corner at the same time. The finish area had volunteers giving you your medal after you crossed the line. They were also giving out water as you can see below in plastic cups. Perhaps I'm spoiled with the races that I've done but water bottles are what I've been used to at a finish. The race also provided heat blankets as well which is a nice touch at the finish. It was warm enough that I didn't really need a blanket so I didn't take one. The race had Protein shakes for people that wanted them. I'm not a big fan but I'm sure many runners like them. The finish area was starting to get quite crowded and quite chaotic as I moved through it. I looked for race results but didn't see anything posted anywhere. Regardless, when I got home and looked for the results, the were already posted as the timing company was good about getting the results up quickly. I would have liked to see how I compared to others in my age group but it was only posted with overall results. 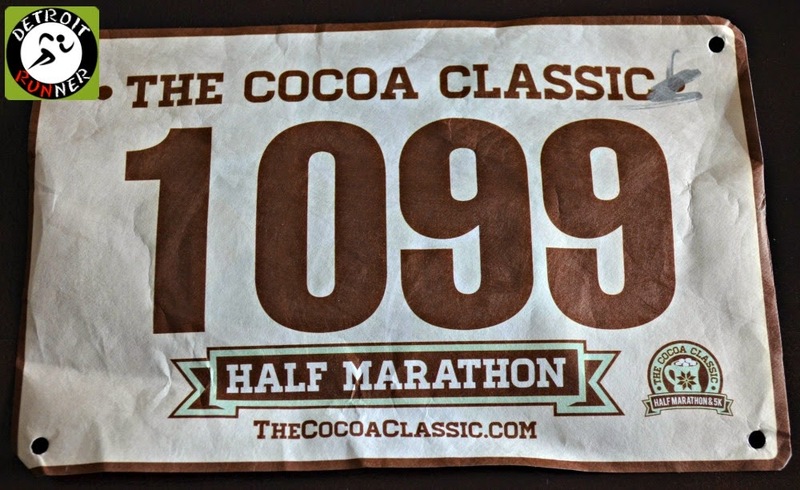 Subsequently when reviewing results at home and comments on Facebook, apparently there was some mix up with race bibs as some runners were showing different names for their bib or were showing Unknown Participant. This relates back to the chaos of the morning and I think having more volunteers/workers would have helped keep things more organized. I know that if you did get an incorrect name or no name result, you could e-mail them and the timing company fixed it. 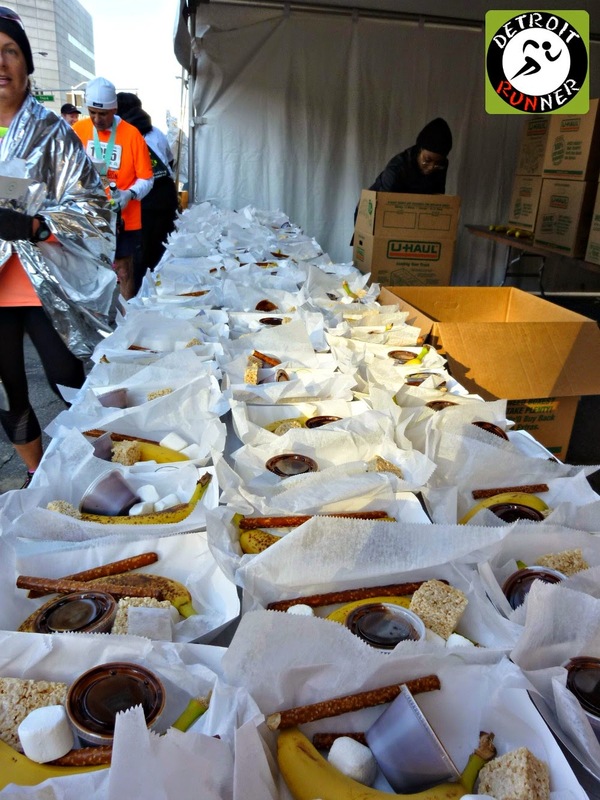 In order to get your food, the race checked off your bib so runners would not go through a second time. Only because I was in the top 100 people, I didn't have any issue getting my food and moving through the line very quickly. I talked to some other runners that just left rather than waiting an hour in line but I didn't personally have any issues with it. The race had the chocolate dipping and stuff to go with it all set up and ready for the runners to take it. I'm not sure why there were not several lines for runners as they finished instead of just one. It could have eased the congestion later on. 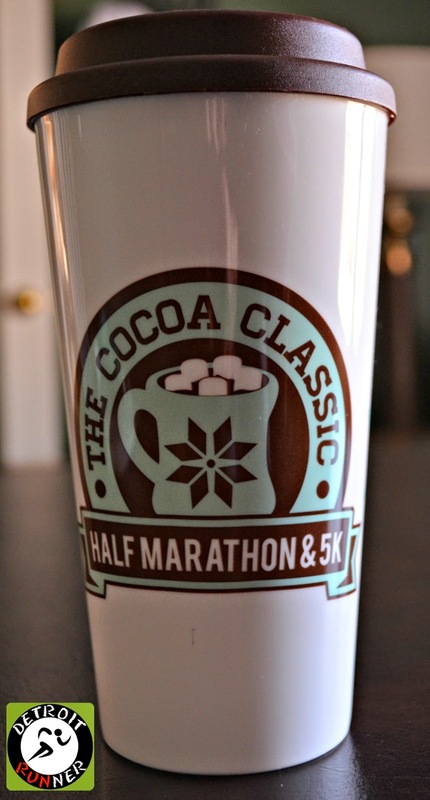 In addition, they gave runners a reusable mug with hot cocoa in it. I think the mug was a nice take away since it's something that you can use and many races do not give them out so a unique idea. I also talked to some runners that never got their mug either since the organization was not ready for the flood of runners. The food that came with the dipping chocolate was a pretzel, banana, rice crispy treat and three marshmallows. I did drink the hot cocoa but I saved the food for my wife when I got home since I didn't feel like eating this after a race. She said it was good. One great idea was having some tables where you could stand and talk. It made it easier to eat and talk without having to hold everything. There really was not enough for everyone but it's a good idea. The race also provided their own ATM's - seriously?!? Why? Because if you wanted to pay for your race registration that day, the company was only accepting cash! I'm not sure what the ATM fee was to obtain cash from it but if the race was going to require cash only that day, they should have mentioned that on their website so people could be prepared. This is a first for me - I've never seen an ATM at a race like this in all my races. Since I finished the race before the 5k got started, I was able to see how registration and packet pickup was taking shape. From the looks of it and from the people that were getting frustrated, things were not organized. Perhaps it would have been better to not have race day registration or packet pickup after all? The registration area should have been in a location not near the start line or set up differently to make it easier. It made for frustrated runners getting in line to race and frustration runners waiting to get their packet. The area could have been planned out much better. Gear check, however, was very quiet. While I've not used gear check for anything less than a marathon, it's a nice touch at any race. It looks like most runners did not take advantage of it though. There were a couple Red Bull truck/cars there for promotions. Too bad it looked like they had tons of Red Bull(next to the truck) but had them all packaged together and were not giving out any? I'm not sure why they would even come if they were not there to promote their product to runners? Before I left, I watched a few of the 5k corrals go off. Now the roping to corral 5k people was definitely something that was needed because it was really crowded. While I didn't run the 5k, it's the only way to keep things more organized with the number of runners doing the 5k. For your race entry fee, you received a partially closed course which was the best part of the race even though it was not a certified course. You also received police patrolled intersections as well as a chip timed race. 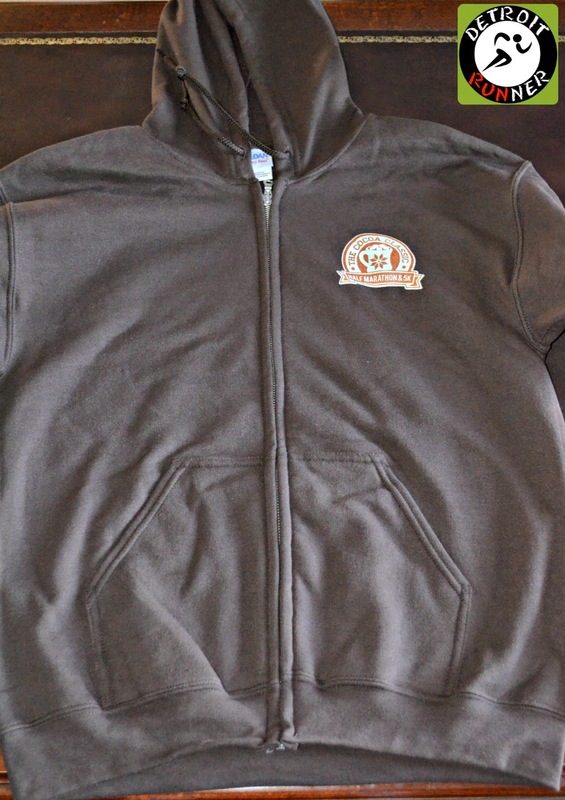 Included in the entry fee of $115(late registration)(Early registration was $85), you received a nice Cocoa Classic hoodie, a Cocoa Classic winter hat(which my daughter promptly wanted), as well as a re-usable mug with the race name on it. The race said they will post participant pictures after the race which you can share. 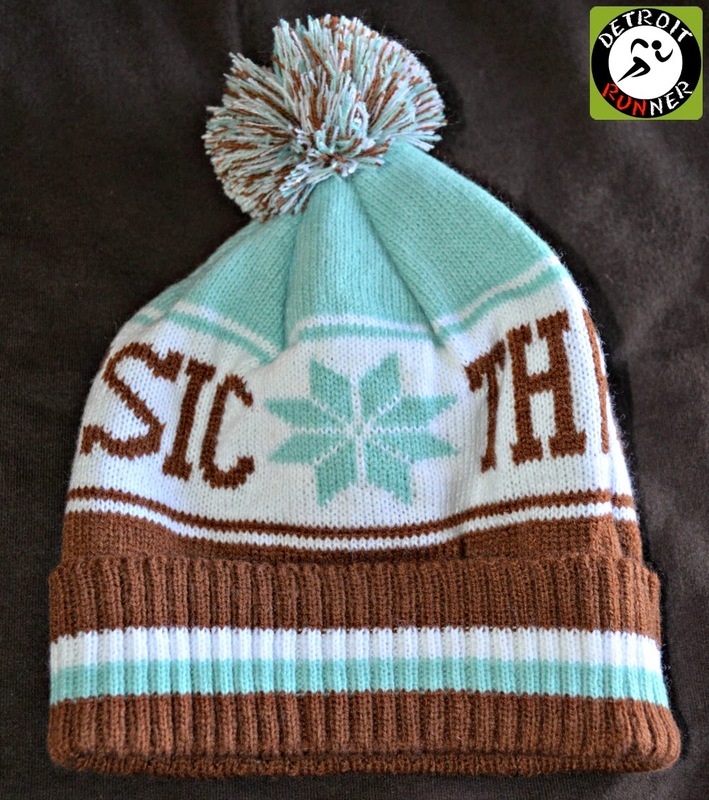 (I received mine and they were very nice, high resolution photos.) A nice feature when most races have photographers charging fees for this. If you ran the half, you received a finishers medal too. While the medal itself is nice, the race should have upgraded the ribbon to include the race name on it. The organization for this race was clearly lacking. Numerous items need to be fixed for this to become a much more successful race. This includes better communication with it's runners. Everything needs to be clearly defined on the website well ahead of the race time. People being told there would be race day packet pickup and then there would not and then there would just caused concerns with runners. The standard response on their Facebook page was to call the office. Whoever was handling the social media accounts needed to have information and posted answers immediately to concerns. It's crazy to think runners need to call the race for answers and it just caused more frustration with runners. In addition, for me, having a course that is 0.21 short of the distance is pretty large. It could have been easily adjusted in Belle Isle or perhaps we could have run around the stairs to get the extra miles. The packet pickup location before the race was unorganized even though I got in and out quickly and the location was terrible. Plan for 6,000 runners accordingly. Also, plan to have enough people on race day including more volunteers at registration, aid stations, course marshals directing runners, and HAM radio operators on course for safety. A runner could have easily been hurt and had nobody around to get help. Overall, the primary thing I liked was the course. It's a great course and a fun route. They also had great swag and while I love a medal, I'm sure I would give up some of the swag for a more reasonably priced race. Of course, in this case, I personally ran it for a race review so I didn't have to pay the entry fee but had I paid, I would not have been happy with how everything was handled. Details are what make a good race great! Unfortunately, given all the other issues with the race, I could not recommend it especially given the prices that they charge. There are plenty of races in the $45-65 range that provide an excellent half marathon experience albeit with less swag. My hope is that the race listens to it's runners and learns from their first road race experience so they can get better at it like they are with their Warrior Dash races. Did you run this race? Let me here your thoughts. Note: I received a complimentary entry in exchange for this review. All opinions are my own and I was not required to give any particular opinion except an honest one. Not sure if you meant to say Guardian Building on the left on one of those pictures heading back into downtown. Great review as always. Thanks for sharing an honest review. It sounds like a very frustrating experience in a lot of ways. A race like this is what makes me really wary when it comes to most inaugural races. I really feel for anyone who made this an "A" race for the spring. It's good that you got a free entry, but too bad for the people who paid so much. At least there was great swag and a lot of money was raised for charity. It looks like you had a beautiful day and I love the blue sky and scenic views in your pictures. The end was a disaster for me. I finished the half around the 2:30 mark when a lot of the 5K runners were finishing as well - way too congested. I had to track down the medal person & was also disappointed that there was no bottle water at the finish line. Nice write up, now I see by your pictures that at the 6 mile mark there was an orange 6 on the road, so it had been measured, were the other marker next to the boards? I find that sometimes a race with be measured properly, but on race morning someone cuts a corner and just 1 mile /km is short and that stuffs up the race. Well done, and thank you for sharing with us.